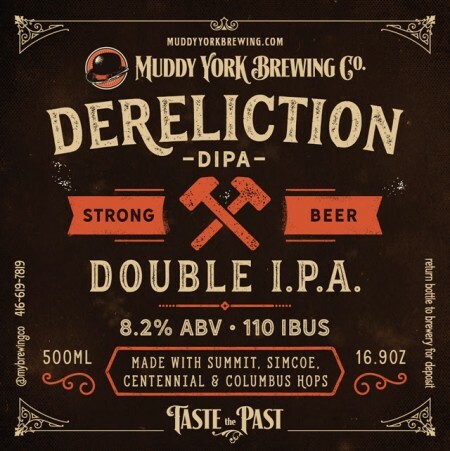 TORONTO, ON – Muddy York Brewing has announced the re-release of a beer designed especially for unrepentant hop lovers. Dereliction DIPA pours a rich golden colour, tastes like a dank pine forest, and has a hop-forward character, in both aroma and flavour. Brewed with Summit, Simcoe, Centennial and Columbus hops, it is well-balanced and drinks more like a classic west-coast IPA than the high ABV rating would suggest. That being said, the label doesn’t lie, this is a strong, delicious, beer. Dereliction is available now in 500 ml bottles at on tap at the Muddy York taproom and retail store.